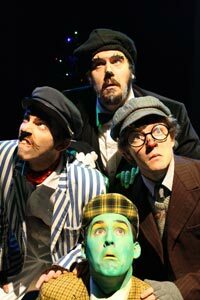 Masters at their markets, The Wind in the Willows follows hot on the heels of the excellent Bouncers and is yet another triumph for the Cardiff-based company. A cast of four adeptly filled most of the roles; charmingly supported by a chorus of children. They take us to the Battle of Toad Hall with a liberal sprinkling of updated references, new scenes and an exceptional synchronised duck, Ratty and boat number. Aimed at younger children, the play dispenses with the need to build the relationships between Ratty, Moley and Badger, so while the actors do a fine job, it’s in the details of the smaller characters where they really excel. Alan Humphrey's Judge hits the delightful line between authority and bewilderment with unerring accuracy. Something of a Black Rat stalwart, Alan is moving increasingly to his much deserved centre stage. As a quartet, the four adult actors play ducks, policemen and sinister weasels, in well-judged hoody attire. When the children also don urban weasel garb the sinister tone is set. At one point, Badger picks up his stick and conscripts the other three, and the excellent casting becomes apparent. Robert Hopkins’s Badger opts to couple his pre-requisite deep voice with moments of playfulness, a kung-fu battle-cry when wielding his stick is one such instance, and is absolutely hilarious in doing so. Calum Small's Moley is a bundle of lovable vulnerability, made even more apparent in his song Underground. Finally, Toady. The amount of energy James Scannel brings to the part is wonderful. Toady is an annoying character, self-absorbed, self-obsessed and self-centred. Irritating. Scannel is wonderfully irritating and gets that difficult task absolutely spot-on. The children loved him and showered his green-gloved hands with high fives. The peculiar idiosyncrasies of the venue were again apparent. As if difficult acoustics, and a vast expanse of wooden flooring aren't difficult enough, the booming baseline coming from somewhere in The Gate would have been, and indeed has been, completely distracting in other plays (perhaps it's the ghost of a long-dead DJ?). It is testament to the skilful professionalism of this excellent company that it barely registered. When you see a Black Rat production advertised, you should really buy tickets. They've earned it and you won't be disappointed.